A range of contemporary and innovative functional kitchen tools and accessories made from tough, high quality material that will stand the test of time, providing unrivalled performance in any kitchen environment. 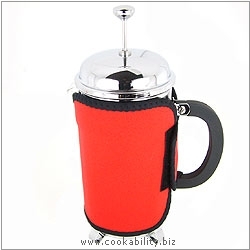 An insulated neoprene cafetiere jacket with velcro fastening that keeps your coffee at the perfect temperature. Cafetiere shown is not included.